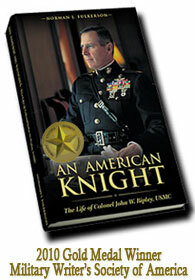 What is not commonly known about this young man is that he looked to the late Col. John Ripley as a mentor. When I read more about Zembiec I noticed the striking similarities between the two men. Both displayed a ferocity on the battlefield which was almost unmatched and both were Catholics and both treated their men with respect. Like Col. Ripley he took time in the middle of battles to write condolence letters to the families of deceased Marines. Zembiec was killed in action on May 10, 2007. He was 34 years old. May he rest in peace! Col. John Ripley and his son Tom were the ones designated by Zembiec himself — should he die in combat– to deliver the message of his death to his widow Pamela. To Read an interesting article about Zembiec, click here. Great story! That is exactly what America needs in these days of political correctness, a warrior who is ready to apologetically do his duty!